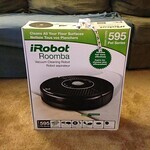 My mother-in-law recently went a little crazy and bought Roombas for several family members, including us. So it’s official. We now have our very first robot. We are now completely vulnerable when Skynet takes over, because one of the machines is living in our house.